With the upcoming release of the new Bond movie Spectre, and with the release of the new Bond book based on an Ian Fleming idea named Trigger Mortis, who wouldn’t want a bit of Q’s hi-tech gadgetry in their arsenal? 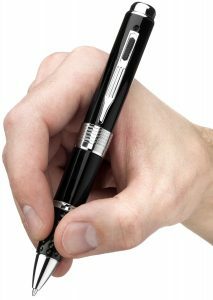 Well you can certainly live that up with the release of this hidden camera “spy pen”, the Teraputics 720P Spy Pen. It shoots in 720p and you can slot an 8Gb micro sd card (one is included) inside it to get up to 20 hours of video footage, for more add in a bigger card. It even records 24Khz audio! The reviews of this have been exceptional and that’s with nearly 300 buyers so far. There are a lot of sneaky individuals out there who don’t trust anybody! And if you’re still not sure there’s a 45 day money back guarantee. Oh, and of course it works as a pen as well, how cool. To review your footage it’s a plug and play device (via usb) and you can use either mac or pc. So all it’s missing is a poisoned dart tip to fend off a 6ft 6″ intruder, right? Getting back on the legal side, the camera is undetectable, no one will ever be able to notice it. You can use it as a webcam if you wish. With the 8GB card you can record up to 20 hours of high res footage or thousands of pictures. The rechargeable battery lasts up to 75 mins. Take it to a business meeting as a handy recording device or a lecture. Or just record a meeting with friends then have a good laugh as you play it back to them later! Or record an oral agreement and once one party breaks it remind them of their commitment, just watch out for a right hook also! But it can also work wonders as it is so discreet. One click turns on the record function so people will just assume it’s a pen and not even bat an eyelid. If you are getting hassled or verbally/mentally abused in your work place use it as evidence for your case. What a gadget!